Admittedly, These Final Fantasy VII Costumes Are Amazing. 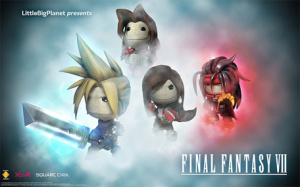 Costumes for Tifa, Sephiroth, Cloud and Aeris will be available for £1.59 / $1.99 each, or bundled together with an exclusive Vincent outfit for £4.79 / $5.99. Sony's also announced an inFamous 2 pack — featuring a good and evil Cole for £2.39 $2.99 — as well as Toy Story 3 and Killzone 3 packs.